They didn't know what I was talking about; hadn't even heard of fair trade, or even fair trade coffee. They were uninterested in the labor that produced the rug, or if their products were produced using child labor. Only one store, Gallerie One, was able to respond, but to do so they had to search around for the Rug Mark flyer, which I found lying on the floor. Rug Mark provides Child-Labor-Free certification for rugmakers. My experience reinforced what I have been saying: that only interior designers can make the merchants respond. As long as interior designers remain as incurious as they currently are about the labor and environmental practices behind the products they specify, can we blame the merchants? 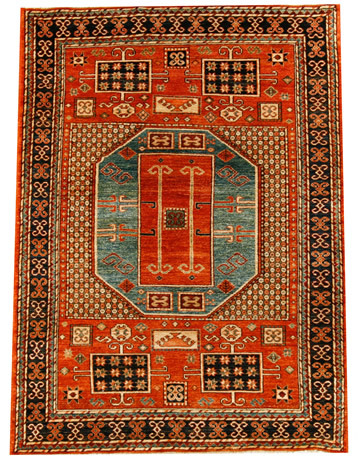 Those interested in buying beautiful, high-quality rugs sustainably produced to support village women, should look at Arzu Rugs. We attended the Chicago Green Homes Fair last weekend at the Chicago Center for Green Technology, and got a good look at the Gilasi Recycled Glass countertop material. It's nice looking, recycled, and local. We would have liked it even better if we knew what was in it, besides glass. 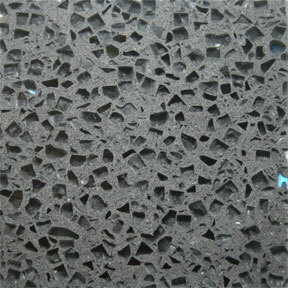 In order to determine how sustainable a material is, it's necessary to know its composition, if not the recipe. Here it is in "slate" color.